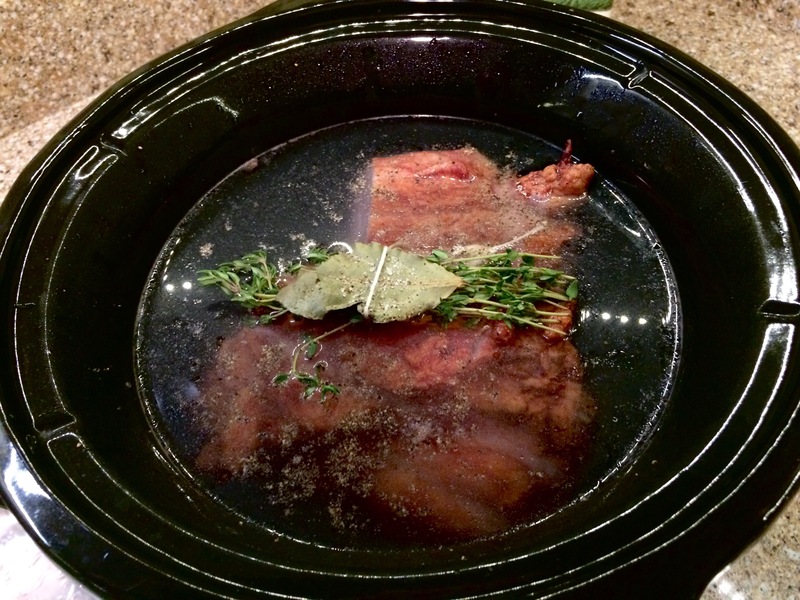 Another hour passes, and it’s time to remove the meat from the broth (it’s falling off the bones by now). I let the meat and broth cool separately while I start the rest of the soup. 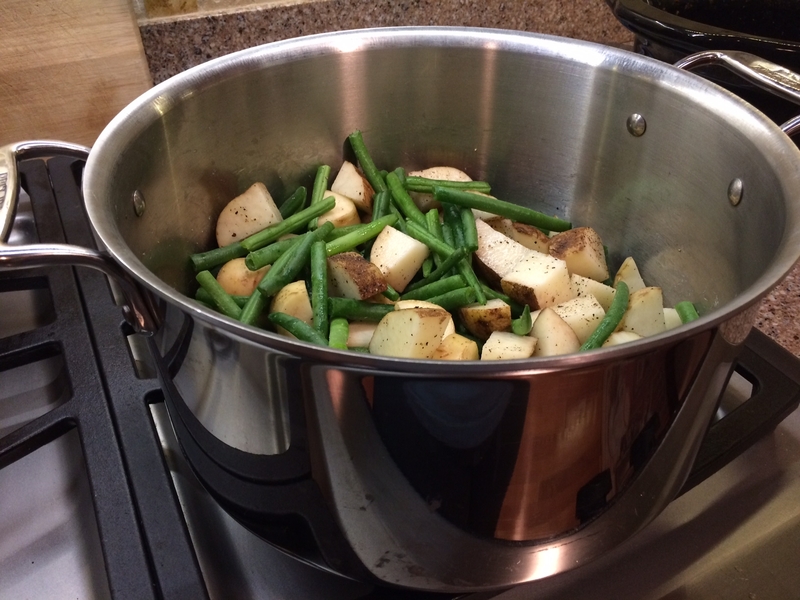 The snipped green beans and chopped potatoes go into the pot with more black pepper. I used about 4 baking potatoes and 1 lb of green beans, but you can adjust however you like it. Green beans and potatoes ready to go! Once the broth cooled, I skimmed off the fat, and added the broth and about 2 tsps each of onion powder and garlic powder to the pot, turning the heat to high to bring it to a boil. I began to shred the ham, removing the bones, fat and skin. The broth was boiling by the time I was done, so I added the ham, turned it down to a simmer, and let it do its magic for the next 45 minutes. Ready to add the final ingredient to the pot! Add a beer battered bread (Which came from a box. Add a bottle of beer, stir and stick it in the oven…it was delicious and offered very little chance to screw up the baking!) on the side, and voila! 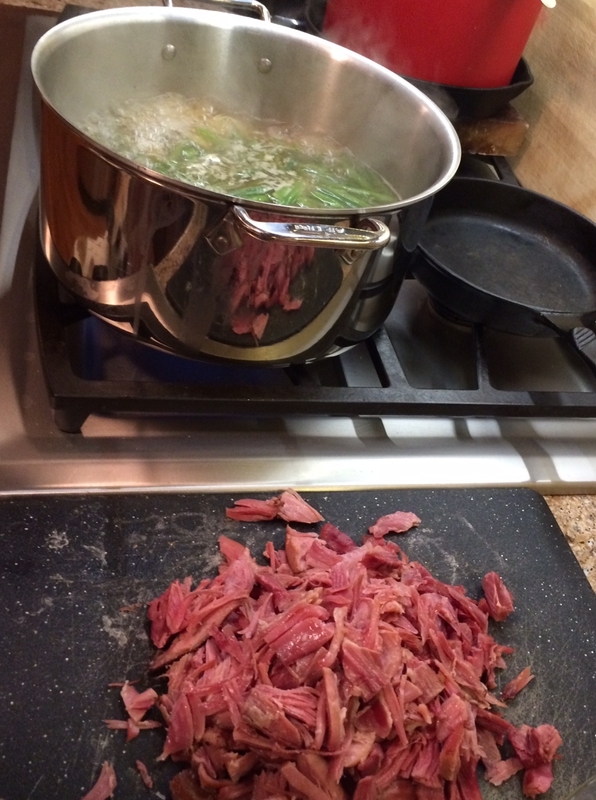 Recreated Green Bean, Ham and Potato soup. 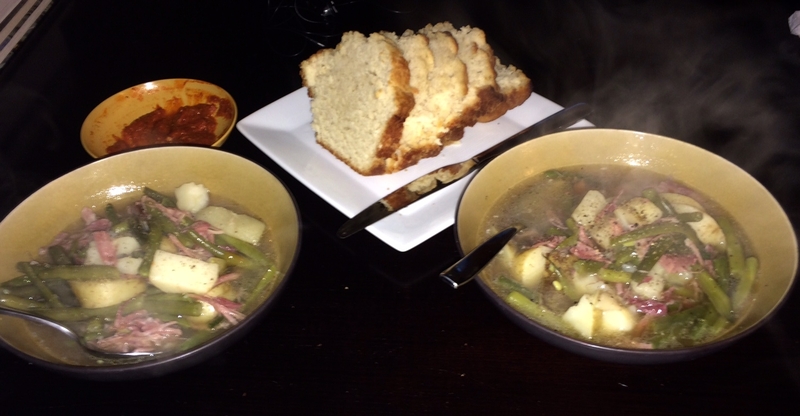 Recreated Green Bean, Ham and Potato Soup (with beer bread and roasted red pepper tapenade). The finished product was a very respectable attempt at the original recipe. The flavors were right on – the only thing I’d change would be the addition of the vegetable bouillon cube – it made it too salty. At the end, the ham would’ve been enough to flavor the dish, but impatience got the best of me (it happens). I ate it as it was last night, but added a little extra water to the leftovers to even it out. As is usually the case with soup, I bet tomorrow it’ll taste even better! 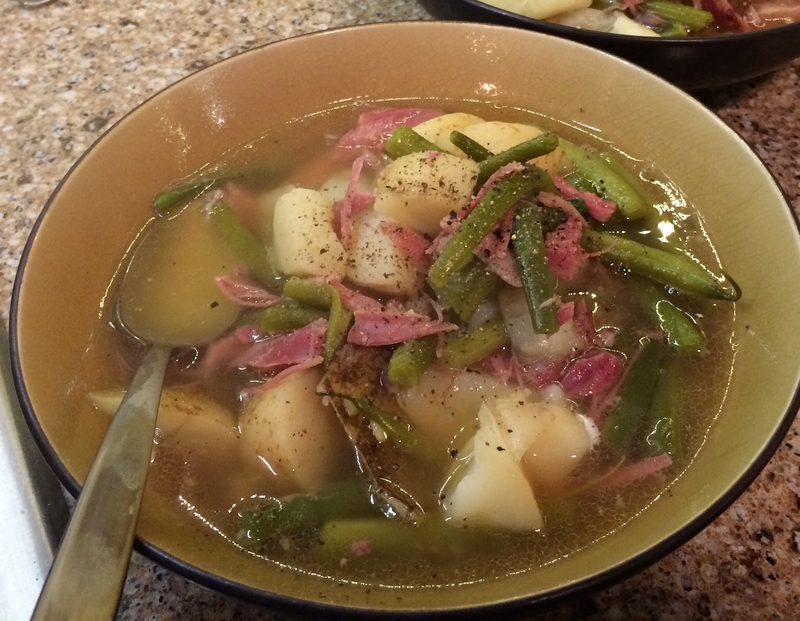 Green bean, ham and potato soup for breakfast, anyone?? Who doesn’t think soup is an appropriate breakfast?